Description of "Liberation Through Education"
One always wonders why one gets educated? Is it to gain knowledge? Is it to use this knowledge gained? Gaining knowledge and using this knowledge are some of the reasons why one gets educated. However, education should lead to other things that are as much, if not much more, important. Education should lead to liberation! This book will try and address the issue on how to make education lead to liberation and on how to make your education a much more meaningful and fulfilling experience. This book started off with what could be written on a single slide in a presentation. It grew into a talk I gave on “liberation through education” and with the positive feedback I got from this talk, I decided to write this book. 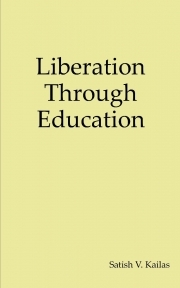 Reviews of "Liberation Through Education"